I have completed a mod which changes monster, spawn and item data. But I was never able to make changes to map data. If anyone has any tips on how to search for the map data as well as town data it would be greatly appreciated. Unfortunately I couldn't find a way to make all the keys available. I tried to put them in a chest but the code acquiring a specific key seems to be very different. You only ever get a specific key from some sort of dialogue event so I had to make use of that. I wanted to increase the number of chests with random keys and wasn't successful with that either. If you beat the Baffle and Brawn key, you will get the Soul key from the king as usual. The reason I used Gismo was because he learns FireAir and IceAir. He's also used in a lot of breeding paths. I really wanted something with very mediocre stats that you would be inclined to breed into your main fighters. I felt there's something special getting to use your first monster this way. I rarely had any good use for Slime. I tried to find all the sirloin prices, but I would need to know their locations to fix them going forward. I will see if I can find the values for the random item drops. This is something I wanted to tweak to increase the rate of finding rods since I removed them from stores. I was torn about the meteorb price. In order to make sure the other choices are worthwhile, the higher cost monsters have very good starting stats. 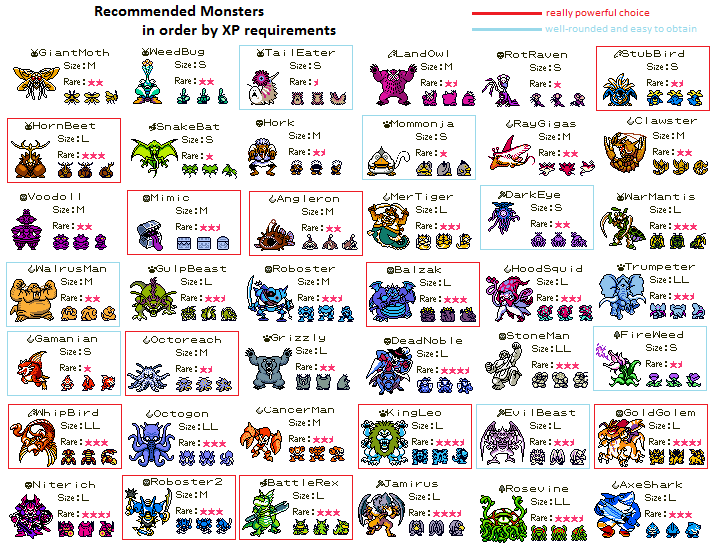 I also wanted monsters you would need lots of for breeding. Some people have complained about making boss monsters too easy to acquire. Be aware there are a few you can find and catch. If I could implement much more sophisticated options I would like to add some of your suggestions. If you want random keys, I was able to increase the odds of getting one from all tiers of the arena. Rather than making everything dependent on Tiny Medals, I tried to set up the arena as a source for Tiny Medals, MeteOrbs and Keys. I also really wanted to change the equipment values, but haven't been successful in finding them. I like your suggestions, If I was much more skilled at romhacking I would implement a character and starter choice screen. If there is demand I could always make separate game patches with different starters. I could also make a patch that awards Brawn and Baffle keys instead of Elf and Lonely. Wouldn't the unique OW boss sprites for Darck and Mudou actually be a good thing though? That means they're probably tile data and that you can edit them without editing their smaller playable OW Sprites. I do not know if it's compressed though. Thanks for the feedback. I'm glad you like the enemy variety and difficulty. Some of the things you mentioned were added in updates. I hope to get another update posted soon to increase the HP of some of the later bosses. I will post an update in the future with some HP tweaks. I thought the HP of the minions would help balance the difference but I guess not. While feasible I wasn't able to find a way to change their sprites. These appear to be buried in map and event data. I tried a few methods to find it but wasn't successful . We'll have to agree to disagree on the boss choices. I find it ridiculous to have these awesome bosses that aren't used. Same goes for rare monsters. They are found randomly in key worlds and I found this very sloppy. The original game is all over the place when it comes to the rarity of encountered monsters. One of the first Magic Keys I received has Roboster2, IceMan, LavaMan, CloudKing mixed in with all sorts of common monsters. When my friend first played the game he quit the story at the Ice key to explore random key worlds. It wasn't long before he found keys with Rosevine, Jamirus and Durran and Divinegon. He was able to skip over most of the breeding. In order to make exploring the story keys worth while I wanted to create interesting monster regions. My biggest complaint with the original game was that the story explores maybe 25% of the content and they left the random keys to do the rest. There was a bug in the RNG that seems to make it so you encounter rare spawns (often two at once) the first time you enter an area. I've since post an update to get around that bug. I will make Sidoh and other catchable bosses require breeding and more meat to catch. This excludes Darck. You must catch him to obtain him in the tower of the Traveler key. Petitbou is arguably the best monster in the game as it has great stats and the lowest xp requirements. Thanks for playing all the way through. I was thinking some bosses after Ice likely needed their HP raised. 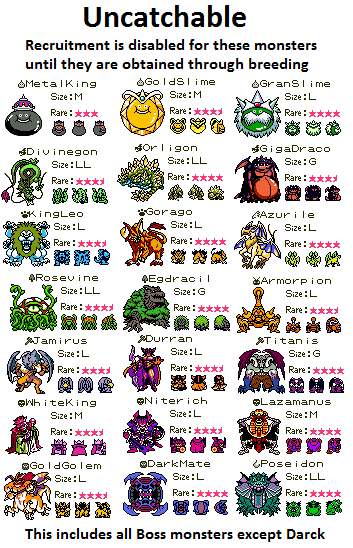 Monsters are regioned by ATK not level. I want to be able to change story and sprites to make the boss changes less jarring, but I'm not able to do that at this time. I wanted real showdowns for the main story. Mudou and Darck are lame. Many rare monsters you can find cannot be caught until they are bred first. Sidoh is supposed to be quite rare, but I don't know how well the RNG works. There was a bug in the older versions. I may have to increase the number of monsters that cannot be caught until bred as well as make them harder to catch. Sky Dragon is now in the Sky World monster tower at the start of the map. I find it odd that you had trouble with him, but not "HoodSquid" or "BombCrag" or the final boss of the ice world. He likely requires a team of level 16 to beat. In 3 playthroughs of that level it beat me ~5 times. Still I should probably look at the XP reward of everyone again. The newest release also fixes the healing values of Herbs. They should help a lot. If you need gold, sell a TinyMedal. Random Masters were intended to be somewhat post-game. They have very tough teams, though it should depend on the key world you are in. Lesser keys shouldn't have very tough masters. I might have made it a bit to easy to acquire higher level keys. This is based on the level of the first member of your party. I was actually planning to make a hack of the first game when I found all the info on how to hack this game. I would have to find all the hex values myself, but I might pursue it in the future. I made the hack with the intention to make areas that you must be cautious about and require more work to capture the monsters. 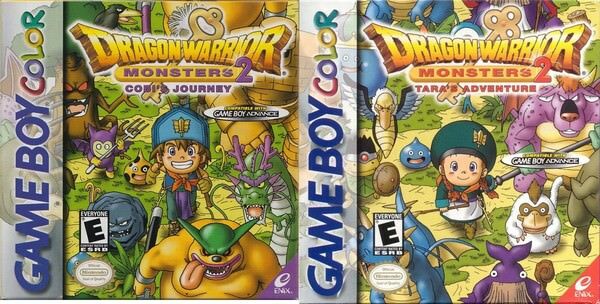 I found the original games don't really matter who you are fighting from region to region. I always seem to overlevel my team in DQ games that I play, so I wanted to make something very tough. The first boss is meant to give you a taste of the difficulty I was going for. That fight is not that difficult, depending on your tactics. A combo of Sap/Upper is honestly OP throughout most of the game. Also, if you get in the habit of using direct commands you're gonna have a bad time. Regardless I've an added an equip to the Oasis store in the latest release that should help with that fight. Sorry about the first arena battle. That wasn't supposed to be that hard, I've reduced this in the lastest release. The fact that you encountered Copycat is very disappointing. The game totals your levels to determine which mimic you encounter. I guess you do not need to be high level to encounter the final mimic which is CopyCat. I will have to see if I can change what level each mimic is encountered at as there are 7. While it is level 99, its stats are not that impressive. In this game a high level monster isn't all that great, since you'll want to give it skills and pluses. It is just good breeding material. Yes, some bosses can be recruited with meat. This mostly includes their helpers or minibosses that don't auto-join. It's likely I will need to make some tweaks to better balance the difficulty level. I'm looking for more testers that can give me feedback on each of the story keys and the arena. Honestly, I would say not to start with hacking a ROM. Check out RetroAchievements.com. This tool was used to create Achievements for old school games. This really just scratches the surface of find and dealing with the values. Their emulator allows you to monitor and change values while the system is running. If you aren't comfortable with examining how others made these achievements, more complex hacks may be be over your head. You can also use this tool to try to understand how gamegenie codes work. As others have mentioned, stick to the system of the game you want to hack as each system could be very very different. If you can find a detailed ROM MAP for the game you want to hack, that can take you a long way. With the right hex editor application, changing values is quite straight forward as long as you understand HEX. However the knowledge involved in traversing opcodes to find a value is several steps beyond that and the skill involved in making any script/function changes is several steps beyond that. I really think you are going to learn more if you have other project to look at as a reference. That's what I thought. I just really couldn't follow the operations. Luckily I was able to figured out what I wanted once I realized addresses FF00 were also WRAM. Now I need to figure out how to find tile sprite pointers.. I have now completed and submitted the hack. Please give it a try and let me know if anything seems like a bug! I am open to some suggestions for further improvements. I have completed and submitted a hack recently for this game. The gameplay aspects are completed however I'm not able to figure out how to change some cosmetic elements. 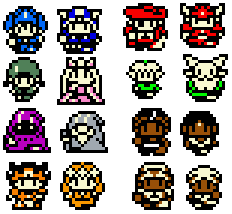 For my hack I would like to be able to change the sprites used in some story sequences prior to battle. Also because my hack is only compatible with the Cobi version, I would like assistance figuring out how to modify which sprite is used by the hero. 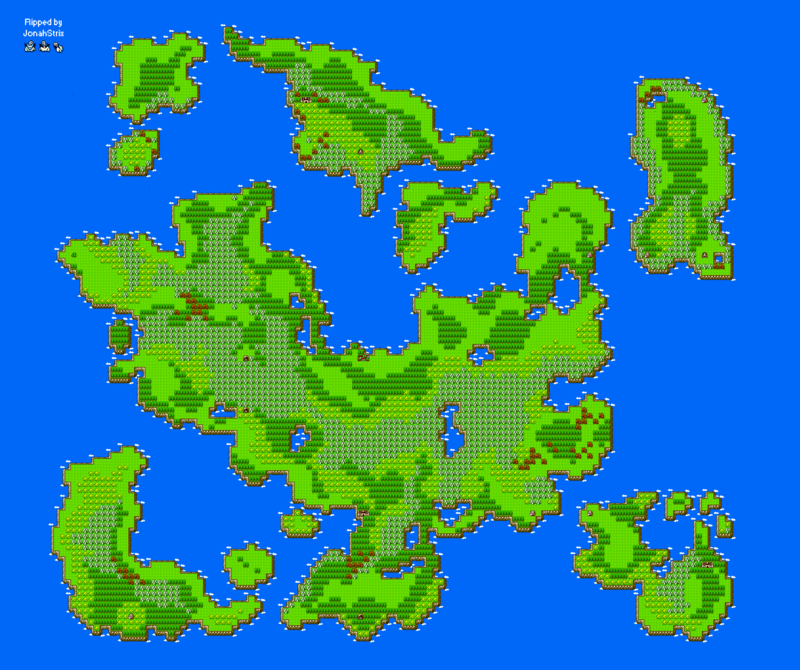 I'm using BGB but I'm not sure how to use the various sprite map tools. Basically I'm wondering if there is any issue with me posting updates or fixes to my hack. For the most part these do not affect gameplay, they are cosmetic changes I'm currently unsure about. If I receive feedback about something being unreasonably difficult or something appears unintended, I may be inclined to adjust gameplay content. Is there any issue with continual improvements? My formula only applies to wild monsters and since it boosts them considerably, it may make what you are talking about easier. However the point was to make enemies much more difficult to account for how easy it is to get high stats. To create wild monsters I take that monster's stat ranks 0-31, then equalize a pre-existing example of that monster to a similar range. I sum those to create the level 1 monster then add the monster's natural growth to raise its level. On harder stages I take those level 1 stats and multiply them. The hardest stages involve a multiplier of 5. At some point the stats of wild monsters will force you to focus more on skills and tactics. Lol, minor trivia that I do all my work in Excel or rather it does the work for me. I look forward to adding this to my SNES Classic. Not enough 2-player games on those systems. Hunt and collect monsters like never before! This hack is essentially DWM2 NG+ for those that have played this game many times in the past and would love a new challenge. Changes have been made to monster encounters throughout the story to provide much more variety and difficulty. Many aspects have been made more convenient to facilitate grinding for the dramatic jumps in difficulty. If you already have a completed save file this can offer great post-game grinding and loot. If you have not tried this series but enjoy a challenging Pokemon-like experience, you should give it a try . I have submitted hack v1.03 as of 28 September 2018. Please give it a try and let me know if anything seems like a bug! If a file is started with Tara, you will remain as Tara if you load the save with the Cobi version..
Changes have been made to nearly all prebuilt monster data. Changes to monster regions to encourage exploration. Monsters are typically grouped by species to improve memory of their habitats. Game now starts at Lv 5 instead of Lv 1. Monster stats are built using in-game stat growth tables and a custom lv 1 formula. This increases with each region to promote increased challenge and provide great breeding options. Custom EXP formula to ensure the challenges are worth it. 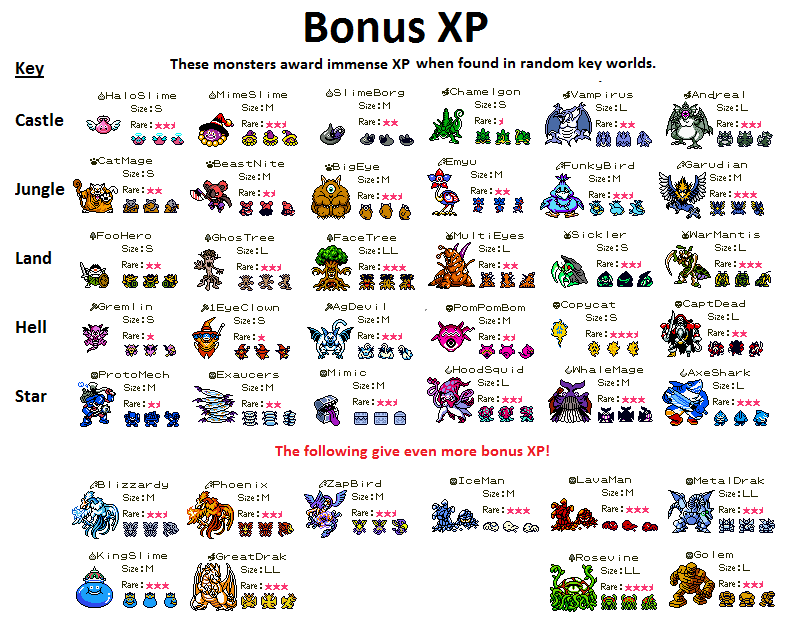 Many monsters have had their experience requirement rank reduced. Out of a total 32 ranks, ultra rare monsters were reduced by 2, rare monsters were reduced by 4, and other high Exp req monsters reduced by 6. Base form Lord monsters can be found and recruited in some story key worlds. Fewer boss fights have unrecruitable monsters some of which require meat. Some monsters are uncatchable until they have been bred first. The number of uses has been increased for Antidote, Laurel, WarpWing, WarpStaff, ExitBell and Books. The effectness has been improved for Herbs, Lovewater, Potion and Meats. Seeds can now be purchased at a post-game store. Staves, seeds and equipment now sell for more. For these I started with the current hack by BCRobert. From there I made some changes. New monsters for ranks Kiddie-S.
After beating S Rank for the first time, a large variety of tough monsters are available to challenge. Greatly increased odds of obtaining a higher level key. The Number of Random Key types has been reduced to improve the odds to ~6% for each key. Random masters have extremely high level monsters including catchable bosses! Some monsters in random keys have had their base XP dramatically increased similar to Metaly. Prince Kameha and Terry now provide a difficult post-game challenge. Elf, Traveler and Lonely world and are extremely difficult with very desirable monsters. It can only be obtained by speaking to to the Old Man with Darck in your party. Darck can now only be recruited from the Traveler Key. Milayou is the ultimate boss fight with stats beyond 999! Using a cheat tool or by trading, one can obtain the Brawn, Baffle and Soul Keys. These now contain tough boss challenges with a promotional event prize monster at the top. The following are incomplete or I was not able to determine how to change the necessary values. I couldn't change Gismo's sprite in the story sequence.. Unable to add additional characters to the Medal Man's Rewards. You should be able to know what they are despite the missing letters. Changes to post-game breeding options. Incredible thanks to BCRobert, DwM2 DD, Secondadvent for figuring out the majority of this game's ROM Map. Also thanks to Dylan and Rabite890 for helping to test this game. I don't know if you'll be back here but I ran into the same problem. This seemed to be the most thorough guide for getting started. I recommend starting on page 61. I'm starting to experiment in the BGB debugger. I'm just experimenting with a shop in order to find the source of the of the item cost. Is anyone able to explain the distinction between F3(run line) and F7(trace)? When I step through with F3, suddenly it jumps to my breakpoint and skips the steps where the registers are loaded with the price. Trace on the other hand goes through numerous loops (likely display) and never seems to get back to the store function. What tool were you describing for stepping through the assembly?